Looking for a more streamlined and contemporary design when it comes to your community park's site furnishings? The Solstice Bike Rack features a round and open design that is meant to integrate into the surrounding area without creating a visual or spatial obstacle. This style is a popular choice for urban centers, colleges, metropolitan parks, and retail shopping areas blending elegance with practicality. Each Solstice Bike Rack can accommodate up to two bicycles and it is available in a convenient surface mount (installation and concrete footing required) or in-ground mount options (poured surfacing). It can be powder-coated to one of 13 color options to match your community's palette. 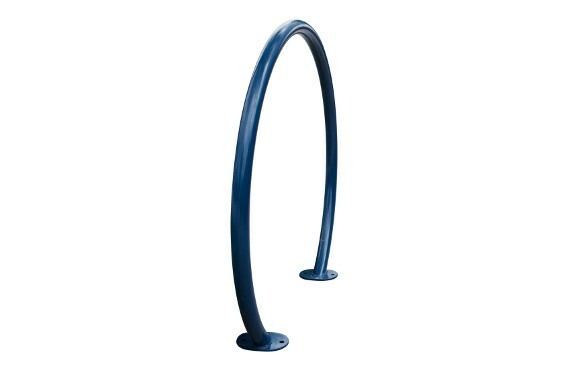 Designed to require minimal space and prevent tampering or theft, these bike racks meet the recommendations of the Association of Pedestrian and Bicycle Professionals (APBP). Dimensions are 37 in height and 42 in width. Surface mount and in-ground mount options available. Surface mount plate is 6 in diameter x _ thick steel plate and MIG welded. Recommended 3/8 x 3-1/2 Concrete Expansion Anchor Bolts for surface mount option (not included). 1.9 OD x 11 gauge pre-galvanized steel tubing. Does not obstruct view or create obstacle for cleaning or landscape maintenance. Available in powder coated or hot dipped galvanized finish. American Playground Company provides a complete assortment of quality outdoor park and recreation furnishings including benches, waste and recycling receptacles, water fountains and more. If you are developing your outdoor space to make it more accommodating to pedestrians or cyclists, speak to one of our customer service representatives. We have the products and experience creating practical solutions and parks that people love.